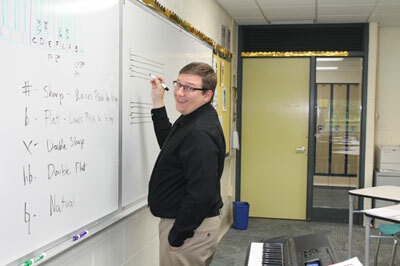 The Performing Arts Department at Notre Dame-Cathedral Latin School promotes creative expression and communication through courses in theatre, vocal music, instrumental music, and music theory. Students develop a sense of ensemble-building, trust, observation, self-confidence, concentration, and creativity and imagination. With applied skills, responsive analysis, and social context at the core of the Performing Arts experience, students gain values that extend beyond the classroom. The Performing Arts Department maintains that everyone benefits from the creative process nurturing skill and talent in all forms of performance.